CBS finally reports on Climategate: Dr. Trenberth interviewed | Watts Up With That? December 6, 2009 in Climategate. and again the MSM fail to properly explain the “hide the decline” comment ! Can somebody write down exactly what Trenberth said. The second part, after the cherry-picking, was indecipherable. Trenberth accuses us of Cherry picking! … in my country, Portugal, except for a couple references in minor newspaper web sites nothing happens. Of course, the blogs are on fire. Cherry-picking? The hypocrisy never ends. I can’t wait till the worthless “value-added” data is released. It is impossible to win a debate when your opponent changes the argument such that you arguing about a natural process of Nature, with implicit understanding that the process is controlled by man. What happened to the argument that man-made CO2 emissions are not causing any global warming or climate change? I was pleased that the reporter at least raised some important concerns, she was wrong however that India and China have announced “cuts” to their emissions. They have only announced non-binding limits on their future emissions increases. At least they moreorless explained the trick to hide the decline. Interesting that Trenberth didn’t utter a word that detracted or changed anything from his quoted statement on “lack of warming.” His only modification seems to be the lame “out of context” excuse. That was not particularly enlightening. Those poor folks who watch nothing but CBS have suddenly found themselves in the middle of a story they know nothing about! How confusing for them. For a CBS report, it was remarkably well-balanced. One quibble, she said “China and India have agreed to cut their emissions”. What they’ve agreed to cut is their carbon instensity (emissions/economic output). A good thing to do, and frankly something that all technologically advancing countries will do, Copenhagen or no Copenhagen. (Even the evil-old George Bush had US carbon intensity fall during his administration). China and India’s emissions will continue to go up at an aggressive rate. You know this entire “taken out of context” excuse is getting old. These emails are not taken out of context and neither are the comments contained therein. The emails stand on there own as prima facie evidence of fraud. No spin by those involved can change that fact. They just won`t give it up will. Prepare for mass civil unrest when temp`s drop and food production is hit, why can`t these idiots admit they have gotten it wrong? Interesting to say the least. Of course that was not the explanation he gave time but them again that explanation made the email worse because it clearly showed his bias of if the the instruments read cooling they must be wrong since that can’t happen. Our instruments couldn’t account for cooling in 2008. So we need to figure out what’s wrong with our system of measurement? With that logic they only work when they show a rise in temp. Seriously did these guys get their degrees out of a cracker jack box? It looks like CBS is still well-behind the curve. It is worth noting that that the MSM keeps referring to the e-mails but has said nothing about the other documents that were leaked which may prove even more damning. By the way, nice Google Ad regarding the Climategate Hoax. It never was about the science, was it? The televisions will have to start referencing climategate with their Copenhagen pieces. Because almost everyone who has Internet access now knows about Climategate, and TV’s won’t make themselves silly. They don’t want to look silly for their viewers, as certainly almost all of us at WUWT agree they are! They will start downplaying it at first, but they will get on the train. No doubt about it! How can you not catch the train of the greatest scientific hoax since Galileo? They will catch it! More smoke and mirrors. Let’s hope the insanity of Copenhagen doesn’t degrade into a steamroller of groupthink…….Good to see the MSM is actually covering the issue though. Let’s make sure it doesn’t go away. Did he (trenberth) just say cherrypicking information and putting it out of context??? hahahahaha..
Isnt that just what the scientists are doing to show a globalwarming? Why do the warmists always revert to the old argument that “the evidence is clear that the climate is warming”? The issue is not whether the climate is warming (or changing), it’ all about the mechanism (s) which drives this change. Deflecting the controversy to this diversion is politically effective, but it’s way off base. Climategate capitalization is the perfect ticket for Congressional candidates to unseat the entrenched incumbent Congresscritters. The travesty is that he dare not repeat his comment it in public, or did he? Perhaps CBS censored him…. I’m so sick of the claims of “cherry picking” and “out of context”… it is the biggest form of intellectual snub we could possibly get. With one sentence they are essentially saying that the years of building this case, the years of making the very context which these e-mails reveal was all bull****. The skeptic community has done the world a favor, and still they give a mouthpiece to scientists who obfuscate reality and throw ego-trips against those who disagree. Interesting the way they covered this. Did it take them this long NOT to do any investigation? Goodness, look at the too cute little picture Trenberth has on the screen behind him. Nice staging. Robert Gibbs’ statement was the expected political response – this administration has a remarkable ability to look a fact in the face and ignore it. I think the senator has the right tone and I’m glad they didn’t dis him for a change. They didn’t look very hard to get more AGW sceptics to quote, did they. This isn’t news. This is pathetic journalism. Phillip Bratby (09:31:36) : Can somebody write down exactly what Trenberth said. The second part, after the cherry-picking, was indecipherable. After following this story and the details that have emerged over the course of two weeks, this late, lame reporting by CBS is pathetic. If there was any spirit of journalism surviving at CBS, they’d pull out all the stops and do up a special; it would take an hour to give a balanced presentation, going beyond the trite bits from the emails. Trenberth’s “analysis” of Climategate is as about as trustworthy and accurate as is his analysis of the climate data. The only travesty is that scientists like him have been allowed to abuse the scientific process for so long. Who really knows what year was the warmest? It isn’t about what year was warmest, it is about the fact that warming is occurring, has occurred in the past, and we don’t know why exactly! We can just theorize, and maybe guess a little, but in the end we just don’t know for sure. And with that admission, would the politicians be jumping all over multi-trillion dollar spending to “save the planet” from this catastrophe just waiting in the wings. Dr Trenberth’s quotes did not address at all the specifics of what he said–that it was a “travesty” that temperatures hadn’t been going up. However, his statement also had nothing to do with the “hide the decline” quote. Let’s see, a bald assertion that 1998 was the hottest year ever. Is that satellite, covering the “ever” of the last 30 years or is that the NCDC, covering back to the 1800s but with temperature “corrections” making the 1940s colder and the 1990s warmer? Why show a picture of a smog-shrouded city when talking about global warming? Smog over a city is a local affect, and you usually can’t even see it if looking at the globe (from space). Why not show a clear snow-capped mountain view? Oh yeah, it’s because we are trying to show that humans are destroying the earth. I could go on, but CBS should hire someone who knows something about the subject to do their reports. CBS interviewing Trenberth on Climategate…wouldn’t this be like interviewing G. Gordon Liddy after Watergate? Interview the guy who got caught red-handed to get his side of the story first. Yeah, “cherry-picking” – – that’s rich coming from Dr. T.
Despite all the media attempts to spin this matter and make it go away, the central issue is NOT whether warming has occurred (depends on start time). And the issue certainly is NOT whether climate changes. That’s inherent in the word “climate”. The e-mails and other files are important because they show how these folk have contrived to “adjust” the paleoclimate record to justify “hottest month/year/decade on record” and to claim that change is “accelerating” and “worse than we thought/projected”. Not to mention evidence of suppressing contrary research, especially in the “vaunted” IPCC crap-o-matic documents. Look at McIntyre’s attempts to question the paleoclimate chapter 6, Briffa’s non-responses, and the IPCC stonewalling on release of all comments and replies. Here’s what the science media ought to be reporting and these are the questions that should be posed, under oath, to Trenberth, Mann, Briffa, and the whole lot of paleo-charlatans. Where do those old trees come from that record temp/precip/something from 1000 AD? Many come from fossil forests ABOVE MODERN TIMBERLINE or logs exposed in sediments BENEATH RECEDING GLACIERS. Hmmm, how do you suppose those forests grew at higher altitudes or in areas later covered by glaciers? Well DUH, it was warmer back then. I need to see the Source Watch Spreadsheet on who is funding these clowns in the video and who is paying for the makup and costumes. It seems to me that reason why so many scientists have said they believe in AGW is because they have spent their lives working to a high set of professional standards, and simply couldn’t believe that their colleagues in Climate Science could be so dishonest. I think that the long term outcome of this affair will be an increasing scepticism of AGW in the general scientific community. This acorn will become an oak. I’m so sick of the talking points “cherry-picking” and “out of context.” OK, wise guys, why don’t you hurry up and GIVE us the proper context then?!? We have the entire email thread series, buddy, we HAVE the context! Why not provide us then with the NON-cherry-picked emails that were not released yet which will offset the meaning, and neutralize the whole controversy? AND I’m sick of hearing about “stolen” “private” emails. The first thing I learned in MIS is that there is no such thing as private emails. “Write every email as if you expect it to be read by everybody.” The emails don’t belong to the senders, they belong to the University, and if they are publicly funded they belong to the public. I was interested by Obama’s press secretary’s comment: “Climate change IS happening…” This is true. It is almost always true, more or less. I see something positive in all of this, i.e., a greater focus on adaptation than mitigation. Much of our infrastructure is very badly designed to cope with any changes in climate, not to mention changes in the weather! Structures are poorly or badly designed to cope with extreme weather events. In my circle, the civil engineering world, much of what is being discussed would be a good idea even if AGW were totally discredited today. It’s funny the warmer alarmists resort to clown makeup to promote their nonsense. Clowns, get it? Love all three clouds on his screen saver. My experience with reporters /journalists after playing 8 yrs of pro football is they try to lead you to say what they want to here , they have their own agenda , they print what they want to print. I remember reading my first article in the local rag about me and saying [snip] , I didn’t say that. About as good as you could get from CBS I suppose. Slow connection today so I didn’t watch the youtube but it doesn’t sound like they asked him about this gem from a Jones email “KEVIN and I will keep those papers out (of some IPCC report) if we have to change the meaning of peer reviewed” That Kevin is most certainly Trenberth as he and Jones were chairing the IPCC group and it makes me dizzyingly angry. If the dissenting view papers were poor science it should have been easy enough to include and refute them — instead Phil and Kevin plot to keep them out altogether. When a major media outlet asks Trenberth to clarify that THEN I’ll credit them with doing their job of investigating news bits and informing the public. The reporter has a lisp so bad she spits all her words out. Sort of like Elmer Fudd. Why is it that CBS hires people with verbal handicaps to garble the news? And why do they show industrial smoke stacks emitting steam as if it was CO2 (a clear, odorless gas as well as the essential nutrient of life)? Do you ever get the feeling that we live in Bizarro World now? Something happened (was it the ’60s?) that caused a goodly proportion of the human race to go stark, raving mad. Trenbooth is distraught that Thermageddon hasn’t happened, and in fact temps are going the other way. Why does that upset him so? What demons possess him? Is he merely a con artist shill for the greatest global graft and fraud of all times? Or is he mad as a hatter? Bernard Goldberg was the first CBS reporter to begin talking about media bias. He wrote a book about it called, “Bias”. He was Dan Rather’s right hand reporter. There was talk of firing Bernard Goldberg because of his bringing up media bias. He is not at CBS now but he was not fired. Dan Rather worked at CBS until “RatherGate”, the faked George Bush military document. Because of their clear bias CBS’s ratings have been declining. But a certain ilk of people will always want CBS type of news. Many of that ilk had probably never heard of ClimateGate—some of whom now wish they never did, IMO. So for inasmuch as CBS in it’s bias made a report on ClimateGate this isn’t too bad a report. Asked for names of potential writers, I feel like an early Lutheran asked to identify his fellow readers of English bibles and knowing that Sir Thomas Gore, sorry More, is reading my letters and tightening his thumbscrews in Chelsea. In other words, like you, I know lots of people who are on side privately but daren’t say so publicly. The other day I bumped into ************** at an event and said something about his global warming views (sceptical) and he froze and said ‘I don’t do that stuff now – people would not touch me if I did’. What can one say to that? I now live in a country where people are afraid to state their opinions on a scientific question. They will have their livelihoods taken away from them if they do. I sometimes have to pinch myself to ensure that this really is happening and I’m not just living in a bad dream. but, are you going to watch Brett Favre tonight? This is OT, but if you haven’t read the book “Taken by Storm” by Essex and McKitrick, you should. It’s an excellent read. If you people who are still skeptical about global warming being real want a reliable source of the truth, then you should click on the National Geographic Google-ad link and go to the “Is Global Warming Real” section. You’ll learn all about how scientists use tree rings to know about temperatures. The couple of minutes masquerading as investigative journalism that followed was scarcely worth the time of the camera crew, let alone the news anchor. Something about “cherry picking” and “out of context”. I can’t honestly remember what was said. But it doesn’t matter anyway. CBS have now fulfilled their contractual obligation to their viewers. They have done all that is demanded to uncover the truth. Whatever happens now or in the future, they can brush off this old tape and say, look of course we covered climategate, it’s all here. The internet is where the real media is. The reason blogs are on fire is because people know they are only getting bias in other places. I don’t know if you’ve seen this fight yet. I one corner Bob Ward, policy and communications director at the Grantham Research Institute for Climate Change and the Environment at the London School of Economics and Political Science. In the other corner Fraser Nelson, political editor of The Spectator. …Don’t forget to click on this one too! Confused About What It Means? Don’t Be! Get the Climate Facts. she was wrong however that India and China have announced “cuts” to their emissions. They have only announced non-binding limits on their future emissions increases. She was wrong also, at this point, to say the emails were “hacked”. Nobody knows, publicly anyway, at this point if they were hacked, leaked, released in accordance with some regulation, etc. But there are very few reporters actually doing their job correctly and getting things 100% right. Copenhagen MUST take place, because they care. Well known writers wont touch it for fear of losing their livelihoods. “..I now live in a country where people are afraid to state their opinions on a scientific question. They will have their livelihoods taken away from them if they do. I may be seeing things, but it seems Kevin Trenberth has the look of a kid caught with his hand in the cookie jar. The tone of that ‘Dictation’ is quite clear: They want to portray Climate-gate as an attack made up by skeptics. It examines nothing, and declares everything. Not even a hint of journalism. The announcer’s facial expression says it all. “How dare they question”. Isn’t that the journalists job? Note the projection by Ward who accuses the “skeptics” of trying to push a political agenda, when it is the warmers who pushing the political agenda, and the skeptics trying to stop it. Ward also uses redirection to another (non)-issue. Ward is a very skilled propagandist. Don’t worry Mark, Rep. Waxman of Cap and Trade fame has the food issue covered with his food safety enhancement bill, -why is the Chair of the Energy and Commerce Committee sponsoring a food bill?? The new regulations are designed to force many farmers out of business. The giving away of raw milk products to family members has already been interpreted as coming under the government’s jurisdiction so lord knows how they will twist this phrase. I guess the bottom line is that we can’t trust any of these inveterate liars, who have been practicing their craft for years. They know that if they sound confident, they will appear to the public as if they are telling the truth, when they are not, What does it matter to them when the truth is told, and they can brush it aside as if it were mere speculation? They are no longer embarrassed by the real truth, because they no longer know what truth is. You will only find that on the internet. Andy Revkin is getting into trouble for being a naughty boy for even so much as mentioning the prostitutes of Copenhagen – an indication that he is no longer trust-worthy. it just pains me to know that all of his emails were typed with two fingers. I would like to see Jake Tapper of ABC ask Robert Gibbs about ClimateGate. He has made Robert Gibbs uncomfortable on other topics. Is CBS unable to uncover one scientist to explain which decline was being hid? Any questions why the MSM has been so quiet ? Excellent find! This should be jumped to its own feature on WUWT. While “hide” certainly raises suspicions, relentlessly misrepresenting “the decline” is a counterproductive pursuit. Trenberth was right a few weeks ago when he accurately predicted that this would backfire. As a nonalarmist I am not pleased with deniers whose actions drive powerful backlashes. We don’t yet know the fallout, but I think it’s a wise bet that only extremists will benefit …and I think it is worthwhile to note who is backing both alarmist & denialist extremists. The foreshadowing is starting to clear up: Extremists at both ends of the spectrum share common goals and will (given the chance) leave sensible, non-extremist folks of the centre out in the cold. It’s a deceptive horseshoe match made in h*ll. Boy, enough of the boring politics. We need to get back to pursuing understanding of natural climate variations – i.e. the shared goal of sensible non-extremists. This is the common ground upon which truth can be built (so expect more bombing of this area by extremists from both ends). Bob Ward, the usual abrasive alarmist using inflammatory language like “witch-hunt” and telling people to “shut up”. Thank you, Ed Scott. The quadrant article for which you provided a link confirms a line of thought that started in my mind a couple of years ago. It would seem to utterly falsify AGW. If it can be shown that the oceans have warmed and that a slightly warmer atmosphere cannot have caused it (an atmosphere warmed by an increase in CO2 concentration) then AGW has a rather big problem, doesn’t it? Is this story about Revkin really real? He seems to be saying that there is no warming, but there must be warming, so the measurements must be wrong. Clearly it has been cooler this last year, at least in the northern hemisphere – this by itself does not invalidate the idea of AGW. As they say, that’s weather, not climate. But the predicted global warming as stalled for something like 5-8 years. One year, may be weather, but 8 years IS climate. My question is this: Did the climate models that the various IPCC contributors use predict this interruption of global warming? I don’t remember the proponents of AGW saying back in 2001 “be warned, global warming will slow to a halt for about a decade, and then resume stronger than ever”. Did anyone publicly (or even privately) say such a thing? I don’t think anyone did. And if their models did not predict such a trend…………………of what value are those models? What is the predictive power of a model that can only predict the past, but not the future? Because the warmists chose to depart from the path of science and go political, the backlash of one extreme political stunt is the polar opposite. 3.) Sees AGW as a vehicle for thier Earth-saving dreams, never stopping to question the direction the vehicle is travelling. News reporting that paints Climate-gate as a bunch of misquoted smiling scientists in tow with the loving Government dumps 2/3 of the popular opinon off in the 1st 10 seconds. Any questions as to why political backlash is so harsh? [Trenberth] is distraught that Thermageddon hasn’t happened, and in fact temps are going the other way. “The global mean temperature in 2008 was the lowest since about 2000 (Figure 1). Given that there is continual heating of the planet, referred to as radiative forcing, by accelerating increases of carbon dioxide (Figure 1) and other greenhouses due to human activities, why is the temperature not continuing to go up? The stock answer is that natural variability plays a key role  and there was a major La Niña event early in 2008 that led to the month of January having the lowest anomaly in global temperature since 2000. While this is true, it is an incomplete explanation. In particular, what are the physical processes? From an energy standpoint, there should be an explanation that accounts for where the radiative forcing has gone. Was it compensated for temporarily by changes in clouds or aerosols, or other changes in atmospheric circulation that allowed more radiation to escape to space? Was it because a lot of heat went into melting Arctic sea ice or parts of Greenland and Antarctica, and other glaciers? Was it because the heat was buried in the ocean and sequestered, perhaps well below the surface? Was it because the La Niña led to a change in tropical ocean currents and rearranged the configuration of ocean heat? Perhaps all of these things are going on? But surely we have an adequate system to track whether this is the case or not, do we not? Well, it seems that the answer is no, we do not. But we should! Given that global warming is unequivocally happening [2•] and there has so far been a failure to outline, let alone implement, global plans to mitigate the warming, then adapting to the climate change is an imperative. We will of course adapt to climate change. The question is the extent to which the adaptation is planned and orderly with minimal disruption and loss of life, or whether it is unplanned? To plan for and cope with effects of climate change requires information on what is happening and why, whether observed changes are likely to continue or are a transient, how they affect regional climates and the possible impacts. Further, to the extent that the global community is able to reduce greenhouse gas emissions and mitigate the climate change, then information is required on how effective it is. This article addresses vital information needs to help understand climate change. I think a lot of people are commenting about Trenberth’s e-mails without knowing Trenberth’s research. Trenberth has (in the past at least) produced important insights on natural climate variations. Again I will point out, if Trenbarf and his ilk were really worried about our planet, and really worried about global warming (aka. climate change), then why are they not ecstatic and overflowing with gleefulness that the world is in fact not warming? A: Because it was never about global warming but rather all about control and opportunity! I don’t get your point at (12:44:22), Paul Vaughan: the language of politics — “extremism” vs “moderation” — is inappropriate here. All the questions before us are binary. True or false. Is warming happening? Yes/no. If yes, is that bad? Yes/no. If it is and that is bad, can we do anything to stop it? Yes/no. It’s not a sliding scale of truth, it’s a one or a zero. Why not just say that climate science has insufficient explanation for the whole kit & Kaboodle? The answer is that climate science was doing just fine before the cabal came along and drove it into a brick wall. Now they are being arrested for ‘hit & run’. Why should anyone defend that? I stand firmly with Icarus (13:45:31) on this one. That was an excellent article. From one of its links, here are a few of the emails between Michael Mann and Andy Revkin: click [Read from bottom to top]. I hate to see Kevin distraught. Let’s see how I can help. Could it be the that the mythical forcing does not actually exist? Kevin mentions natural variability, but then realises this is not a sufficient explanation – “what are the physical processes?” he asks, quite rightly. 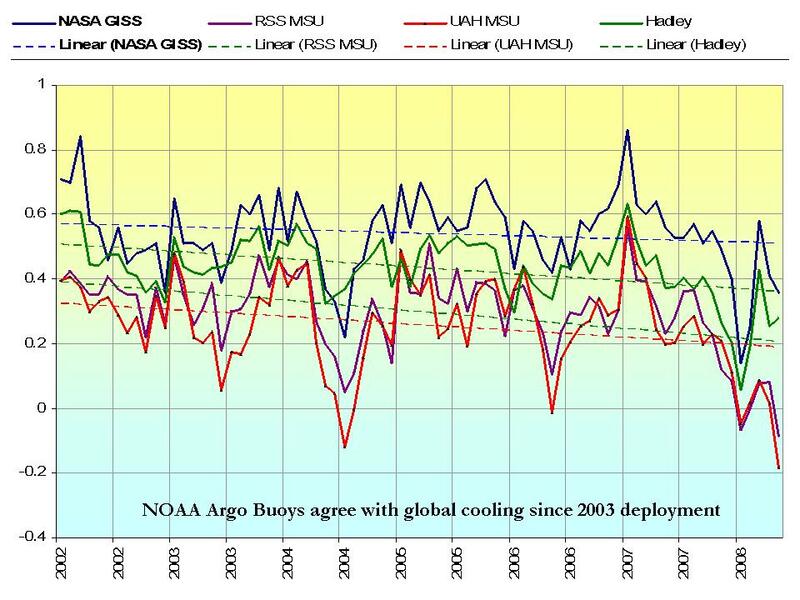 No Kevin, the Argo network has shown no accumulation of ocean heat content since 2003. No again. As much ice has been gained in Antarctica as has been lost elsewhere. I hate to see Kevin so distraught so here’s my suggestion: remove the mythical CO2 forcing from your mind, and everything will become copesetic. I think it’s pretty amusing that anyone here would be taken in by this stuff. In fact it’s comical. Like breathing on an ant nest – someone has you all running around and falling over each other in your eagerness to trumpet evidence of ‘the Great Global Warming Fraud’. Wise up folks. You’re doing yourselves a disservice. You can do better than this. It’s interesting how skeptics are apparently slandering climate scientists by publishing what they, the scientists, have written. NPR just aired an interview with Judith Curry on Climategate. Pretty soft stuff but at least it was mentioned. Curry mentions the refusal to comply with FOI requests and Peer Review bullying (my words). With out saying his name Curry compliments McIntyre. The fact remains that the climate models did not predict the current stagnation in warming, either due to the models themselves or due to their inputs. Do the modelers have any idea why this is so? And why then should these models be trusted? We’ve been through all this before here. You should really follow the conversation for a while, and review the WUWT archives, before making assumptions or quoting people like Trenberth, who states in a lot of words that he simply doesn’t have a clue about what’s happening. That’s because his mindset is that heat from CO2 must be stacking up somewhere. From an energy standpoint, there should be an explanation that accounts for where the radiative forcing has gone. Was it compensated for temporarily by changes in clouds or aerosols, or other changes in atmospheric circulation that allowed more radiation to escape to space? Trenberth appears to be endorsing Prof Lindzen’s iris theory. Was it because a lot of heat went into melting Arctic sea ice or parts of Greenland and Antarctica, and other glaciers? Like the rest of the alarmist contingent, Trenberth cites the Arctic, without mentioning that total global ice cover is increasing. Since the question concerns global warming/cooling, his conjecture fails. Was it because the heat was buried in the ocean and sequestered, perhaps well below the surface? As the 3,300 ARGO deep sea buoys show, the ocean is cooling. Was it because the La Niña led to a change in tropical ocean currents and rearranged the configuration of ocean heat? Global cooling has been going on a lot longer than La Niña. Trenberth’s speculation is just more of the same old “there’s hidden heat in the pipeline” conjecture. His problem, like that of all true runaway global warming believers, is that he’s trying to fit the facts into his hypothesis, instead of accepting that the facts falsify the CO2=CAGW hypothesis. Thus, Trenberth flounders around trying to make a case, based on speculation, that what we observe is something other than natural climate variability. Clarification: My interest is in natural climate variations. I have noticed that this is an interest which I share with both alarmists & nonalarmists (even though some of the alarmists are “in the closet” about it, for fear of media misinterpretation). My definition of “the enemy” is those opposed to truth (regardless of what labels are pinned to them). One effect of the fallout of CRUgate seems to have been the shattering of weak alliances. For this reason (as well as others) I have my doubts about the accuracy of speculation regarding who was behind the leaking/hacking. Btw: For a good laugh, take a look at the hopeless attempts at spin being conducted over at RC. ok not much to do with Hansen, as he’s the Talleyrand of Climatology. What is interesting is the picture that emerges of how the closed group really find it necessary to rebut at any cost anything that they diasagree with in advance. It seems that they are a myopic bunch who are convinced so much of the dogma of global warming that they need to erase anything that doesn’t conform to it. What Jones is doing is saying that Christy’s analysis and the satellite data is flawed because it doesn’t conform to CRU data. They then find ways of justifying why its flawed before questioning its veracity. Simplicity is often beautiful & powerful, but I do not share your desire for unhelpful & inaccurate simplicity. The issue is not “whether or not” there is warming, but rather the degree to which natural climate variations are as well-understood as the tides — everything else in the “climate discussion” is just noise (…noise that concerns people a great deal, I’ll acknowledge). … so when data produces a warming trend it is to be seized on regardless of the flaws in the technique: When it doesn’t show a warming trend, then obviously the apparatus is at fault. However, it seems that the reason for “adjusting” data sets whether derived from satellite or surface thermometer is not their relation to recorded temperatures at all, but their divergence from computer models used by the IPCC. In other words, models are more important than data. You make no mention of UHI. Do you think there is no such thing as UHI? For the record: I have made no mention of “moderation”. Common ground exists without need for moderation. The (unmoderated) common ground is a need to better-understand natural climate variations. This is exactly why I expect allied-extremists to keep targeting it from their respective “sides”. From an energy standpoint, there should be an explanation that accounts for where the radiative forcing has gone….Was it because a lot of heat went into melting Arctic sea ice or parts of Greenland and Antarctica, and other glaciers? The earth is in a cooling trend. And in 2008 Arctic ice was in a rapid growing trend. Global warming is not happening Icarus. Arctic ice is not in a shrinking trend. Antarctic ice is not in a shrinking trend. Which Glaciers are being referred to? All glaciers are shrinking? Is Greenland ice in a shrinking trend? Is there any data to verify your quote? Trenberth: Was it because a lot of heat went into melting Arctic sea ice or parts of Greenland and Antarctica, and other glaciers? No, because if the arctic melts, a large amount of energy is being lost during the process (although its true that c02 is more active at subzero regions than non subzero regions – but its still negligible an effect). This demonstrates a failure on Trenberth’s part to understand exactly what c02 is capable of, which isn’t very much. He’s really saying that the mascot is more potent than the baseball team here. Trenberth: Was it because the heat was buried in the ocean and sequestered, perhaps well below the surface? no, as LW outgoing radiation (from the surface) doesn’t do much to the atmosphere as it is, let alone something with such a great heat capacity as oceans. Trenberth: Was it because the La Niña led to a change in tropical ocean currents and rearranged the configuration of ocean heat? Unlikely. Heat isn’t a “solid” with a fixed/constant magnitude. Thermalisation takes place at normal temperatures very quickly. Yes I was completely wrong about that – I thought the emails were faked when they talked about using a ‘trick’ and ‘hiding the decline’. However, that’s no comfort to anyone who seized on these emails as evidence of a massive hoax or conspiracy amongst climate scientists, since it is clear that they reveal no such thing. This is just a quote from some book. It is not reality. The earth is cooling now. What you claim is happening isn’t happening. The earth is not arrayed in the things you imagine. The global warming emperor has no clothes. I’d agree. He vacillates between scepticism and belief – erring on the latter for some reason – to keep in the peer review process i’d imagine. It is not a sufficient explanation to say that a cool year is due to natural variability. Similarly, common arguments of skeptics that the late 20th century warming is a recovery from the Little Ice Age or has other natural origins are inadequate, as they do not provide the physical mechanisms involved. There must be a physical explanation, whether natural or anthropogenic. My understanding is that it is taken into account when using the raw temperature data. Is it not the case that using only the data from the best-sited monitoring stations makes virtually no difference at all to the temperature series? Actually, no. If he’s ‘distraught’ about anything it is about the fact that climate monitoring systems are not yet capable of tracking all the energy in the climate system as it flows between reservoirs such as oceans and atmosphere. sounds like you just said we don’t really understand all the complexities of climate. i think we all need to take a deep breath, realise that most of the forcing has been from outside forces, and get back to science. sure, If india and China agree to the summit and sign the protocols then continue unexpurgated increasing emissions, they can say, when presented with the *divergence* from their intentions and their actions, then can just say “We were taken out of context”. In fact if you steal $300 worth of goodies from your local department store, you can say it was taken out of context in court. Thats just scientifically ridiculous. Its saying that model predictions are better than the climate, so when the thermometers show cooling then, well, there’s something wrong with the climate, since the models are wonderful. Trouble is, cooling wasn’t predicted, so it can’t be accounted for, so it must be hiding in the broom cupboard. Actually, if you turn your heating down this winter, and it goes cooler in your home, that heat isn’t migrating.. It is thermalising at the new temperature. Heat, like force, is a form of energy. It isn’t a solid. If you pull a lever then force and resistance are inferred. Let it go and it returns to equilibrium. The energy simply disippates. Hey man, what’s your gig? If your gig was real there’s no need to make stuff up, or exaggerate. So your gig isn’t real. Take a lesson from your first reaction after ClimateGate broke. Get out of the made up science. Your reliance on fabrication has become a bad habit. Please provide the link to where UHI has been taken in to account by the man that wrote the book you quote. La Nina is not happening now. El Nino is. Yet the earth continues too cool. You have not addressed the things I pointed out to you except for UHI. You must have some environmentalist agenda. Are you a member of, or do you head up, an environmentalist organization? Mark (09:44:45) :Prepare for mass civil unrest when temp`s drop and food production is hit, why can`t these idiots admit they have gotten it wrong? Accuweather.com is predicting snow in California potentially down to the valley floor and possibly even in the S.F. Bay Area. Verrry Unusual. The nations ‘vegetable and fruit basket’ is about to become a snow bowl. They twist things so much, using false analogies, for one. Since there is no danger to begin with, even if the CO2 effect were 3 times as great, then 1/3 of no danger is no danger. I would have liked to see Lindzen’s answer to that bit of propaganda. My concern about Jones: He has mucked around with 1940s temperatures without addressing confounding (i.e. shared variance) involving EOP (Earth orientation parameters), clouds, etc. In fixating on British vs. American ships (taking the measurements), he has made a mistake we teach Stat 101 students to avoid. Reporters used to go into ecstatic fits over FOI requests which were delayed and denied. She must have skipped that day in journalism class at the University. Hmm, yes we have to be careful, its almost too good to be true. As others have since commented, one would expect more caution, especially since Revkin has already been burned by his appearance in the emails as an apparent Hockey Team cheerleader. The threat to give him the ‘Big Cutoff’ serves only to confirm that is/was in league with the Team. …but perhaps someone needs to contact the author and confirm. It is happening and it is real. I’m in private contact with no less than 4 different folks who want to contribute to work showing AGW is a hoax and the data are shoddy, all of whom have shared their names with me, and all of whom begged anonymity as they would be vilified at work if they were “outed”. They use pseudonyms on the public boards for fear of retribution from the warmistas. At least 2 have Ph.Ds in technical fields. The other two have degrees, but I’m not sure the exact level. At a recent gathering of alumni from a prior employer, one of the managers began to effuse over “Al Gore’s New Book!”. When I said “WHY would anyone ever want to read his stuff, it’s broken science without foundation” … well, lets just say I was not the most popular guy at the punch bowl… (but in the parking lot, a couple of folks agreed). I suspect that whoever “leaked” the UEA stuff was such a “mole”. Had to say the right things to keep the job, but could not stomach the fraud and sleep at night. Speculation, but it fits the date stamping and surrounding events. Basically, the AGW “Attack The Messenger” meme has simply resulted in a very large Underground Resistance movement… Vive La Resistance! After Dr. Trenberth and his Climate Crisis Crew have rejected the obvious conclusion that the continuing increase in CO2 concentrations does not force a continuing increase in global mean temperature, then it isn’t surprising that they are stymied for an explanation for a lack of continued warming. Honest people and good scientists would conclude that the hypothesis linking CO2 to a continuing or runaway rise in temperature has been falsified. The earth is in a cooling trend. And in 2008 Arctic ice was in a rapid growing trend. Global warming is not happening Icarus. The data says you’re wrong. Just as a matter of interest, what magnitude of change in global temperature do you think constitutes ‘trend’ rather than just natural variability, and over what length of time? Can you justify your answers rather than just give unsupported figures? Climate models showed that the temperature would increase in line with global warming through the last 10 years. Such modelling even led organisations like the Met Office to say that 2007 would likely be the hottest year on record. these models have failed for the moment. (The trend of cooling is expected to last for sever decades, according to even the proponents of AGW) which is why Phil Jones said it would be nice if it were to warm to prove the sceptics wrong. 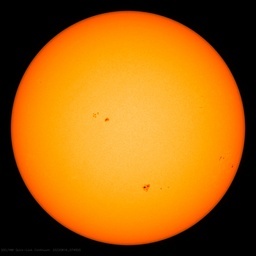 Other forecasters using historical data reconstructions, or solar techniques say the whole century ahead will be a cool one. There are several issues related to this however: What causes warming, and what causes cooling? Incidentally, the Met office say that in the UK there is a 1 in 7 chance of a colder than average winter, yet a 50% chance of a milder than average winter. That must mean a 35% chance of an exactly average winter. Thats hedging bets for every conceivable scenario! I don’t have time to read all the comments but I wish to register my disgust with this CBS segment as it frames the issue of replacing recent proxy data with measured data as if it were merely using the most accurate data when the issue is that the proxy used is not correlated with those modern measurements so that past measurements would be relevant to reality. It makes it seem that they did nothing unusual – at least to many viewers. As an aside, they also use a slightly less common spelling of climategate (i.e. climate-gate) though putting that down to intent might be a bit too cynical on my part. Then again, I didn’t become cynical by living in a world of ethical behavior and professional journalism. I suppose I should consider CBS to be noble for having breathed the word “climategate” in any form. Let me go work on my gratitude skills. My fear of global warming is not very high right now. Our 3-day forecast here in Montana is for lows of -13, -17, and -10 degrees F. Highs will be in single digits. No, they would not. Are you just going to throw out 100+ years of evidence that CO2 is a greenhouse gas? If you are, then further discussion is completely pointless. If not, then you have to accept that increasing atmospheric CO2 does cause an enhanced greenhouse effect. You also can’t ignore the last 40 years of global warming and pretend it didn’t happen just because one year (2008) it cooled one tenth of a degree (or appeared to). In the paper I quoted from, Trenberth is saying that there is an “an estimated imbalance from the enhanced greenhouse effect of 0.9 ± 0.5 W/m² (with 90% confidence limits)”. Now, you could legitimately argue that in 2008 this imbalance may have been offset by a change in cloud cover, causing no actual warming in that year, but other explanations also have to be considered in which the energy was there but we were unable to identify it – Trenberth’s paper discusses all these issues and highlights how important it is that we have the technology in place to answer such questions. The ‘travesty’ he refers to is that the climate information system is currently not capable of doing so – although raw data which has yet to be made available may provide some answers. None of this constitutes global warming having been ‘falsified’. Here is more of the discussion, Tom Wigley also is at a loss to explain why temps have not increased as they predicted…..
>> These sums complement Kevin’s energy work. Can anyone point to a data source for the amount of energy being radiated out to space in the two low frequency CO2 absorption bands? Surely tracking this would indicate how much more energy is being trapped by CO2 increases in the atmosphere. The alarmists claim that their theory is backed by Physics and hence the amount of energy in these bands making it out to space should represent the maximum that can be retained. It is my understanding (based on what I’ve read) that these bands currently radiate zero energy into space because it is all trapped by existing CO2 but I’d like to see satellite graphs to confirm. Why would this not be the upper bound on additional “greenhouse” effect fro CO2? I would have tried asking the same Q on realclimate but it seems their recent relaxation of censorship is at an end, I was censored for responding to a particularly vacuous posting, my guess is mentioning upside-down proxies did me in. Gavin seems to invoke quite a deal of magic in dealing with inconvenient postings – mostly involving disappearance. Actually I was having some trouble with the last book of the series until Climategate broke. Deathly Hallows sounds like CRU must feel right now. Gavin Schmidt and the Half Baked theory are other titles in the ongoing RealClimate series. What data? And don’t cherry pick. Do you need to watch Anthony’s melting-freezing youtube video again? What magnitude of change in global temperature do you think constitutes a ‘trend’ rather than just natural variability? Can you justify your answers without using massaged data? You have it backwards. It is not ‘global warming’ [by which I assume you mean the CO2=CAGW hypothesis] that needs to be falsified. The long held theory of natural climate variability is what your new conjecture must falsify. Because in order to replace the theory of natural variability, CO2=CAGW [AGW for short] must explain reality better than natural variability, and it must be capable of better predictions. It does neither. As climatologist Dr Roy Spencer observes: No one has falsified the theory that the observed temperature changes are a consequence of natural variability. It is the alarmist crowd that must falsify the theory of natural variability, which has been the accepted climate theory for more than a hundred years. But now a new hypothesis – AGW – has appeared. In order to preempt the theory of natural variability, AGW must explain reality better than the long accepted theory of natural variability, and it must make more accurate predictions. It has failed. Skeptics question the AGW hypothesis because there is no empirical evidence that human activity causes any measurable global warming. The putative “evidence” comes mainly from GCMs — computer climate models. But models are not evidence; they are only tools. And climate models are unable to predict; they can not even predict today’s climate by hindcasting, using all current and previous climate data available. Empirical evidence means real world evidence, which requires reproducible, testable and falsifiable measurements, showing that X increase in atmospheric CO2 results in X amount of warming. Despite enormous expense to date, such evidence is completely non-existent. Empirical measurements have never shown that an increase in carbon dioxide causes a subsequent, quantifiable rise in global temperature. And geologically, a rise in CO2 is an effect that follows a rise in temperature; it is not a cause. Further, the recent coincidental rise in global temperature and CO2 has now broken down: CO2 and temperature trends have completely diverged for most of the past decade. If you can falsify the theory of natural variability, in which the climate oscillates within historical parameters irrespective of CO2 levels, then I — and in fact the entire Western world — will sit up straight and pay attention. Because you will have been the first to do so. Please keep that in mind when you feel the urge to write that ‘nothing has falsified global warming’. It is the empirically baseless assumption claiming that CO2 is the cause of any observed warming that must falsify the existing theory of natural variability. So far, it has failed. I think this is ultimately the way out. I’ve been wondering for some time how most of the world’s politicians are going to find a wat to admit they’re wrong. This is the answer, except with “not increase” in place of a predetermined “cut”. This can be done in an advanced economy when people just buy a new car. Quite harmless, almost certainly beneficial. Bravo! This is one of the major reasons I think the long-term trend is with us, and that we need only keep our cool to let the acorn sprout. The scientific societies that endorsed AGW did so primarily on trust. (I’m sure they didn’t invite contrarians in to rebut the rebuttals that the alarmists provided them. They simply concluded that the debate was over.) Now that outsiders can see climatology’s close-mindedness, cliquishness, bullying behavior, and worse “under the rock,” I’m sure many of them are going to have second thoughts. There is no way that this elephant can be hustled under the rug. Therefore, mainstream opinion is going to have to give contrarian views and spokesmen some respect and a place at the table, and concede that the science is at least somewhat unsettled. That’s enough for the moment. Once the momentum has shifted (in a month or two? ), then we can press for independent reviews of “the science” to sort out the mess. That’s what it looks like. Scientists from other disciplines will detect this unscientific attitude. You’ve given me a good laugh already. I am an infrequent commenter here. Hide the decline refers to the palaeo data not corresponding to measured data. I have problems with this as do many others. I also have problems with past records being changed, eg. That is the US lower 48 records. NOW, 2006 & 1998 tie for warmest with 1934 later in the series! I was so disgusted with this modification, I didn’t check which was actually 3rd. I guess this will end up in the spam bin as all my recent posts have! If you want us to continue watching, sort this spam problem out please. As always, when your ilk cannot answer a question you sidestep. So I’ll ask again: please provide a link to where I can read that UHI is accounted for in your quote. If you are not going to address the flaws in your points then please save your sidestepping for someone else. I am not going to play your game with you. You’re just going to get a bunch of distraction from Icarus. He has addressed nothing I asked him for. He has fallen back on the usual alarmists game of obfuscation. And what he is saying is the same old stuff they always say. One of my comments earlier didn’t appear for a while too. But after some time it did. I really don’t think you are being censored. You are one of the most leveled headed and careful commenters. And about GISS–CEI is suing for their slow FOI response. Maybe NASA will comply. Well, the old standby troll Icarus has an explanation. It’s a quote from some book of a guy kicking around some ideas for the cooling. It’s less reliable than the Mann Hockey Stick. Icarus: "None of this constitutes global warming having been ‘falsified’. And none of us are saying it does. Why paint with such a broad brush, Icarus? Or are you on the defensive?? However the recent cooling from the the observations…as opposed to the extrapolations…are quite intriguing. Regardless, your “40 years of warming” is hardly a mega-cycle in the PDO or the AMO….so you can’t positively prove the 40 years for your cause. You just go on keep flying around too close to the sun. It ain’t cool to fool with Mother Nature like you climate wizards are trying to do. And chances are She will find a way to melt your wings…even if it is in the middle of a deep solar minimum. So no, “global warming” (as you say) has not been falsified. Point taken. The earth has indeed warmed. Its called recovery from the Little Ice Age. But ANTHROPOGENIC global warming, (which you do not say, but imply) does not need falsifying. It, pathetic scientific specimen that it is, falsifies itself. “Wait a minute. Are you saying that this is all like that movie “Wag the Dog?” I’m living in a virtual world where everything around me is computer generated and under the control of a self-righteous religious cult??? And they have conspired to manage my behavior by using psy-ops, torture, endless propaganda and psychological assault??? All in order to steal my worldly assets and turn me into an Orwellian frugalaton??? Then tell me they’re ‘saving’ me and millions of others and to be grateful??? Glad to hear that we agree. No, they would not. Are you just going to throw out 100+ years of evidence that CO2 is a greenhouse gas? (strawman argument, your words not mine) If you are, then further discussion is completely pointless. If not, then you have to accept that increasing atmospheric CO2 does cause an enhanced greenhouse effect. (false, CO2 has continued to rise, temperatures have reached stasis and declined for 8 years) You also can’t ignore the last 40 years of global warming and pretend it didn’t happen just because one year (2008) it cooled one tenth of a degree (or appeared to). 2009-40 years is 1979 a period during which “climate” experts postulated that we were on the verge on another Ice Age. Rural temperatures in the U.S. haven’t, on average, been rising for the past 100 years, only urban surface stations reacting to the UHI effect indict a rise, while satellite data disagrees with the surface station temperatures. The hypothesis is that rising CO2, and CO2 is still rising, leads directly to rising temperature and ,hysterically, a runaway effect. The is the “proven” hypothesis the Copenhagen Climate Conference is predicated upon and the hoax tempting the politicians to wreck the economies of the civilized world by radically cutting carbon emissions. The hypothesis has been falsified. CO2 does not drive temperature regardless of the undisputed fact that it is a greenhouse gas. Are you trying to say the cooling trend the earth is in is not statistically significant? Is that what you meant by “what magnitude of change in global temperature do you think constitutes ‘trend’ rather than just natural variability, and over what length of time?” If it is you may to recheck your math on that. We could go back to the Medieval Warm Period. That should settle your argument. Thankyou for the kind word; keep watering the acorn. I’m sorry if I gave the impression I felt I was being censored. I know that is not the case. I am aware that others have had the same problem too. I was just pointing up that the spam filter has a problem and that is an annoyance, especially as being able to see the message awaiting moderation enables quick fixes to errors within ones posts. 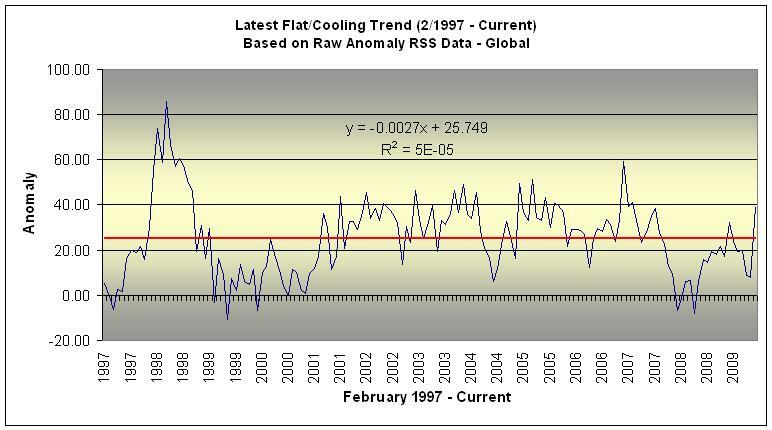 Are you trying to say the cooling trend the earth is in is not statistically significant? There is no ‘cooling trend’. The Earth is still warming at around 0.2°C per decade, as it has for several decades. However, let’s suppose you’re right. How much temperature anomaly constitutes a trend (or deviation from a trend), and why? Is it 0.1°C? 0.4°C? 0.7°C? How long does it have to persist for you to be confident that it represents a real long-term change, and why? What data are you using? And what are your start and stop dates? Are you seriously confident that “several decades” adequately describes a global temperature trend? trends are either benign or not. Even the change from the balmy MWP to the LIA was relatively benign, although the change from the LIA to the Modern warm period was even more to the advantage of organic life on earth. However, nothing remarkable can be recorded in the last 40 years, in fact, supposing the data is massaged, which it obviously is, then the warm trend that caused alarm and climate conference revelry was the period from 1979-1998, as caused by the pacific climate shift – not that anyone really noticed any cataclysm in 1998 – Prior to that was a relatively benign cooling period of 35-40 years, preceded by a warming period from the beginning of the century, when temperatures were the same, or slightly warmer than today. Its a flat trend thus, since 1900, and even if the figures were thrashed, deleted and contorted to produce 0.2 per decade, then I can’t say that’s a bad thing at all, unless you’re an outright misanthrope. Incidentally, this has nothing to do with *greenhouse gases*. They are limited according to forcings, and, of course, their wavelength at which they absorb small amounts of radiation. you can download raw data from various weather stations, or natiopnal meteoroligical organisations, and even johm-daly.com which uses raw data from NASA and CRU, just to see how cheeky and galling those closed circle of statisitcs manipulators have been. No Kevin, you were right first time, the forcing has gone. Then what was the forcing, and why has it ‘gone’? There is no evidence of a ‘stagnation’ in warming – the planet is still warming at around 0.2C per decade, with the ‘noise’ of interannual variability superimposed on that trend, and that is what the models successfully reproduce. Take it from the perspective of the radiative properties of c02. It doesn’t interact with heat leaving the earth – the molecular structure of a carbon dioxide molecule doesn’t change, and it still absorbs outward radiation at a peak of 15 microns, with 13-16 at the shoulders. This matters in chemistry, as it corresponds not to ordinary temperatures such that are found between the surface and up to 100 metres above . With altitude temperatures cool, so the greenhouse effect takes place close to the earth’s surface (this was proven by heinz Hug and Jack barrett) So that leaves c02 at its most active where temperatures are in the subzero range of the centigrade scale, between -27 and -50C which are typically found in the mid-upper troposhere. What is the thermal mechanism by which temperatures in that region send heatwaves back to earth? It was established long ago – before global warming became an issue – that of the total heat leaving earth, only less than 8% of it is absorbed by c02 at these subzero temperatures, and that this doesn’t change according to quantity, but constant according to its bandwidth – in other words, an increase in 50ppm of c02 would absorb the same amount of heat as the first 100ppm – which still remains a miniscule effect, and that the same amount of radiation leaves from the lower stratosphere whether there were 100ppm of 600ppm of c02. Here are the figures which, when plotted, even show a warming trend in the stratosphere in the last decade. The models reproduce this but the models have failed, which is why Trenberth finds it a travesty that it can’t be explained. Theres obviously something wrong with the climate, and not the models thus.. Phil Jones also finds that “it isn’t very nice” that his AGW colleagues predict that the world will cool until at least 2030, much as would be expected. This is an odd subjective comment for 2 reasons. Firstly, Jones is *nominally* against warming becausehe contrives to tell us it brings on catastrophe. Secondly, it explains a lot about the AGW perception: That c02 is the cause therefore the world ought to warm, when clearly it isn’t. The only method it was made to warm was by adjusting data, though that was artificial – the nature of climate-gate – proves what was known all along – that temperature data was quite fake in the first place. The physical process is Ocean Heat Content, SST’s solar forcing, and clouds. Some radiation from teh sun stores up in oceans, which then heat up the atmosphere. This is proven by precipitation increasing everywhere. If the atmosphere heated oceans, there would be little precipitation, though if oceans heat the atmosphere then there will be an increase in precipitation. When precipitation increases, a lot of heat is lost from the system, so the atmosphere cools, which is has been happening for the last 10 years. Heat loss and cooling. I am 5’8, but my neighbour is 6’2. The difference between us is 6 inches, so we are both 5’11 therefore, which makes me 3 inches taller than I am. So what was Trenberth referring to as being a “travesty”? Please explain. ““The global mean temperature in 2008 was the lowest since about 2000 (Figure 1). Given that there is continual heating of the planet, referred to as radiative forcing, by accelerating increases of carbon dioxide (Figure 1) and other greenhouses due to human activities, why is the temperature not continuing to go up? The stock answer is that natural variability plays a key role  and there was a major La Niña event early in 2008 that led to the month of January having the lowest anomaly in global temperature since 2000. While this is true, it is an incomplete explanation. In particular, what are the physical processes? From an energy standpoint, there should be an explanation that accounts for where the radiative forcing has gone. Was it compensated for temporarily by changes in clouds or aerosols, or other changes in atmospheric circulation that allowed more radiation to escape to space? Was it because a lot of heat went into melting Arctic sea ice or parts of Greenland and Antarctica, and other glaciers? Was it because the heat was buried in the ocean and sequestered, perhaps well below the surface? Was it because the La Niña led to a change in tropical ocean currents and rearranged the configuration of ocean heat? Perhaps all of these things are going on? But surely we have an adequate system to track whether this is the case or not, do we not? … but we cannot fully explain all the wiggles on that line – all the natural interannual variability. We know that a very strong El Niño was responsible for the warmth of 1998 but perhaps we can’t explain exactly why 1989 was 0.1C cooler than 1988, etc. You can see that Trenberth is perfectly happy to acknowledge the possibility that in 2008 the additional greenhouse warming wasn’t just hiding somewhere that we aren’t yet capable of measuring it, but could have been temporarily offset by “changes in clouds or aerosols, or other changes in atmospheric circulation that allowed more radiation to escape to space”. None of this changes the fact that the anthropogenic radiative imbalance exists, and that it is causing additional warming. Trenberth could have been saying exactly the same thing in 1988, and no-one is going to argue that the world wasn’t warming then and hasn’t continued to warm since. Just look at the data. Trenberth isn’t saying “global warming has stopped and we can’t explain why”, he’s saying “global warming is continuing but we can’t fully explain all the natural variability around that warming trend”. There is no contradiction between what he says being true, and the fact that there is a long-term warming trend of around 0.2C per decade. And he’s right of course – given the huge importance of understanding the climate, it *is* a travesty that we can’t yet adequately monitor it. Incidentally, do you see anything at the end of the graph I linked to above that looks any different at all from the ‘wiggles’ of the last 30 – 40 years in which long-term warming was undeniable? I don’t. Icarus. The same old nonsense. Its obvious that Trenberth is looking hard for something that isn’t there. ie: That doesn’t exist. This is typical of the sort of gall that thrown out of the sausage factory A radiative imbalance doesn’t exist – as if it were the atmosphere would not be cooling. Its been cooling for 10 years. Althouh Trenberth doesn’t understand radiative physics or chemistry, it is to his credit that he can’t explain the lack of warming of the last decade when his colleagues are trying to cynically hide the actual data. This is the same Trenberth who preached hurricane panic associated with the human forcing ideology. The simple answer is that there has been none, otherwise it would show with temperature measurements. 40 years of unprecedented warming. Certainly not. Of course, the data is purely adjusted. select two, three, even four data sets from each geographical area, then merge then in to a global plot, and then say that there has been any significant warming of the globe, either since the last 40 years or since 1900. What Trenberth is doing is akin to the speedlimt. Since the speedlimit is 70mph, then its physically impossible for a car to go faster than 70mph. These are rather silly conclusions. ps. We’ve already gone through why Trenberth is in error. Trenbeth says “the fact is we can’t explain the lack of warming and it’s a travesty that we can’t”. You say (paraphrase) “Ah he doesn’t really mean there is a lack of warming, he means there is a lack of visible warming.” You provided further Trenbeth quotes where he puzzles over the reasons why we can’t detect this warming that is occuring even though we can’t see it. Despite billions of dollars invested by the world in Argo submersible networks, satellite altimetry and microwave sounding units to measure the climate to “unprecedent levels of accuracy”, the warming that Trenbeth apparently says is occuring, still escapes detection. Can there really be no possibility, none whatsoever, that there is NO warming? No, he’s saying that we ought to be able to find out whether changes in clouds or aerosols temporarily offset the anthropogenic warming in the short term. That doesn’t constitute ‘endorsing Lindzen’s theory’. If you can prove what the net change in global ice mass was for 2008 (the period Trenberth is discussing), then by all means do so – otherwise you can’t claim that ‘his conjecture fails’. “Argo is a global array of 3,000 free-drifting profiling floats that measures the temperature and salinity of the upper 2000 m of the ocean.” (my emphasis). It seems we can’t rule out sequestration in the deep ocean after all. Don’t forget that there is no such thing as ‘global cooling’ at the moment – the world is warming at around 0.2C per decade – but anyway, Trenberth was talking about identifying short-term natural variability, not long term trends. We know that there is a net anthropogenic forcing of around 1.6W/m² and we can see the effects of that in the current global warming trend, so it’s entirely reasonable to discuss the details of the natural variability superimposed on that warming trend, and Trenberth is right to point out that we can’t yet adequately measure and identify all the physical processes involved in that natural variability. Read his paper again and you’ll see what I mean. Instead of your baseless speculation that some mysterious hidden global warming is lurking below the 6,500 foot depth of the oceans, just read Vincent’s comment above yours. Keep in mind that there is thermohaline circulation of the ocean layers, and if there was “heat in the pipeline” it would have been detected by now. Actually, you and Trenberth are simply running out of excuses. Cognitive dissonance prevents you from admitting the likely probability that there has been no measurable global warming over the past eight years. See my post in the current ‘Smoking Gun’ thread @09:11:42. You will see that when the Team’s artificial “adjustments” are removed from the raw data, no warming is evident. Only by placing your belief system in the hands of those massaging the data [and who still refuse to explain their methodology] can you trust their pronouncements that significant global warming is occurring. And if minor global warming is occurring, it is a natural function of the planet’s emergence from the LIA. It is not caused by humans; there is zero proof that CO2=AGW. ZE-RO. The climate has been through the same cycles repeatedly throughout the geological past. Occam’s Razor tells you to avoid adding unnecessary explanations to natural occurrences. The scary thing is, Trenberth is the least corrupted scientist in the whole corrupt AGW bunch. They are just science nerds who have unexpectedly become media stars by fudging the numbers for fame and money. They are bought and paid for. And now they’ve been caught. Prove me wrong. Have them disclose all of their raw data and methodologies, which they continue to stonewall. ““Argo is a global array of 3,000 free-drifting profiling floats that measures the temperature and salinity of the upper 2000 m of the ocean.” (my emphasis). It is true that the heat could be below 2000m of the ocean, but this is extremely unlikely. Why would it all go down to 2000m without any heat showing up in the much more probable upper layers? There is no clear mechanism for this to happen. This whole argument is starting to have the feeling of desperation about it. And yet there can be no possibility, none at all, that the warming has stopped. We are aware of what Trenberth is saying. Smokey, Vincent et al are interpreting what he couldn’t find and that explains what Trenberth fails to conclude. Trenberth of course admits to being in the dark. As for anthropogenic *forcing*, no such thing exists, unless it can be proven. There is no evidence of this. Nevertheless I assume this anthropogenic forcing doesn’t refer to carbon dioxide, since thats a physical impossibility. Incidentally, did you look through the youtube video, or plot the graph from the suggeste source? sometimes Icarus, you just have to think outside the box. Instead of your baseless speculation that some mysterious hidden global warming is lurking below the 6,500 foot depth of the oceans, just read Vincent’s comment above yours. 2: The variability represents genuine fluctuations in the Earth’s energy balance. In other words when the global temperature appears to drop in any particular year in the middle of a warming trend, it could be that there really is cooling (due to clouds or aerosols or whatever), or it could be that we failed to identify where the warming went in that particular year, but either way the trend is still there. Neither of these two possibilities in any way contradicts the warming trend – we can see it right there in the data. If that’s true for (say) 1981 then it also has to be true for today. Keep in mind that there is thermohaline circulation of the ocean layers, and if there was “heat in the pipeline” it would have been detected by now. ‘Heat in the pipeline’ usually refers to heat that the Earth will accumulate in *future* years due to radiative forcing, not to heat that it has *already* accumulated. OK, let’s test that claim. How much temperature anomaly constitutes a trend (or deviation from a trend), and why? Is it 0.1°C? 0.4°C? 0.7°C? How long does it have to persist for you to be confident that it represents a real long-term change, and why? Only by placing your belief system in the hands of those massaging the data [and who still refuse to explain their methodology] can you trust their pronouncements that significant global warming is occurring. Sorry but there are many independent sources of climate data and they all show the warming. To suggest they are all in on a vast conspiracy is just absurd. Besides, the natural world reflects the warming too. And if minor global warming is occurring, it is a natural function of the planet’s emergence from the LIA. It is not caused by humans; there is zero proof that CO2=AGW. ZE-RO. The climate has been through the same cycles repeatedly throughout the geological past. Occam’s Razor tells you to avoid adding unnecessary explanations to natural occurrences. Then what is the forcing causing the warming of the last 50 years? Their work reflects observed changes in physical and biological systems all over the world, so I’m inclined to think you’re wrong. You can have the last word as far as I’m concerned. This is my final comment to you on this thread. Look at all the people correcting you above, and your mind still appears to be shut tight. Do you really think everyone else is wrong, and you are the guy with the right answers? First off, no one is saying there is no global warming. Yet true believers constantly try to re-frame the argument that way. I am saying there is no empirical measurement that shows any cause and effect between rising CO2 levels and rising temperature: click. Therefore, CO2 can not be the forcing you believe it to be. And your GISS 0.1° y-axis chart magnifies any temp fluctuations to make them alarming. Here is one is with a normal y-axis: click. Not so scary, eh? And explain how prehistoric SUVs caused higher temperatures 140,000 years ago: click. You’d best start worrying about freezing, rather than warming. The central argument is whether a rise in CO2 will cause a subsequent, runaway rise in temperature. But as you can see, there is no cause and effect correlation between rising CO2 and rising temperatures: click. Further, CO2 has been many times higher in the past, for millions of years at a time, even during ice ages: [click on graph to expand]. Next, “heat in the pipeline” is not a scientific term. It was invented as a fudge factor by alarmists who were unable to identify the heat from increased CO2 that they were just certain must be lurking somewhere. You fall into the same trap. You are unable to accept the possibility, even the likelihood based on real world measurements, that the effect CO2 is so insignificant that it can be completely disregarded; its effect certainly is so small that it is empirically unmeasurable. By asking “How much temperature anomaly constitutes a trend”, you show that you don’t understand what a trend is. A trend is a function of time, not temperature. And as stated above, trends are subjective. That is why I post charts with widely varying time lines. Pick the trend you prefer, but they all contradict the CO2=CAGW conjecture that a handful of crooked climate scientists are making fame and fortune from promoting. Next: “Sorry but there are many independent sources of climate data and they all show the warming.” That is only because you read sources that you agree with. Realclimate, for example, routinely censors viewpoints contrary to AGW. If you go there you won’t see the true climate situation. If WUWT was run like RC, your posts would never see the light of day. Aside from the charts I posted here showing plenty of cooling episodes, here’s a more recent one: click. Do you consider GISS an ‘independent source’? Me neither. But UAH, RSS and ARGO are credible, and they all show cooling. Do you still want to claim it’s a ‘conspiracy’? Or that “they all show the warming”? Why pick an arbitrary 50 years? Why not 5 years, or 5,000 years? The warming of the planet has the same causes on different time scales. Unless you can prove otherwise. If so, you will be the first to be able to do so. You don’t seem to understand Occam’s Razor: Never increase, beyond what is necessary, the number of entities required to explain anything — William of Ockham (1285-1349). By adding a completely unnecessary entity — CO2 — to the natural ebb and flow of the climate, you make it more complicated for no justifiable reason. For the umpteenth time: there are NO empirical measurements showing that an X rise in CO2 causes an X rise in temperature. Unless that sinks in, you will always be going down the wrong garden path. Finally, concerning your last assertion, “their work” is still kept hidden. They refuse to abide by the Scientific Method, and disclose all of the raw and adjusted data and methodologies, and any quantified “observed changes” they used to support their conjecture that CO2 will cause runaway global warming and climate catastrophe. The Scientific Method requires full transparency, beginning with the raw data, and the methods they used to adjust the data to get their results, and the computer algorithms they used, and anything else that has any effect on their conclusion. Why do you trust people who refuse to show you, or any skeptical scientist, their data or methods? Apart from the fact that educating Icarus may be impossible, you do a nice job of explaining why he (and so many like him) are so wrong. Nice job. If you don’t have this website, which has tons of real science that debunks the warmers myths, you might like it. C3 is one of my favorites.